Website of one of Austria's biggest insurance companies. In addition to this one, other web presences are realised with Gentics CMS. The customer portal myUNIQA as well as direct sales and numerous customer services were integrated into the content platform via Gentics CMS using technologies such as JSF, GWT, etc. 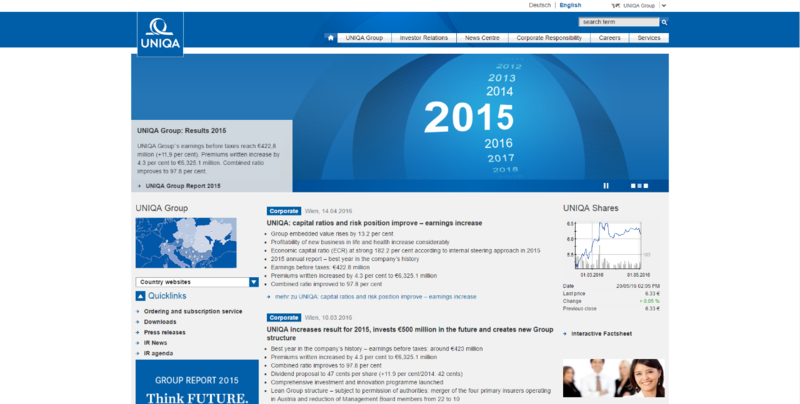 In addition to UNIQA Österreich's customer website, a bilingual corporate website of UNIQA Group was also implemented. This is where the investor relations information pertaining to listed UNIQA Insurance Group AG is also published. When uniqa.at was relaunched the content management system was also replaced. UNIQA Österreich relies on the Enterprise CMS of leading Austrian CMS manufacturer Gentics. Other UNIQA web projects are carried out by UNIQA IT Services, which is responsible for UNIQA's IT projects together with Gentics. In the scope of this cooperation, numerous interfaces for a variety of systems are being implemented so that the Gentics CMS is able to operate as a central content management platform. The new multichanneling function is also used at UNIQA Österreich. This makes it possible to display a website, but make modifications in specific areas. Gentics also produced the largely identical website of Salzburger Landes-Versicherung – www.salzburger.biz this way. Another application is the implementation of mobile web versions, in which a large number of content items can be displayed in different ways on a mobile basis. The content managers enter the content from a central location. Every change is automatically accepted on all channels – these are the displayed pages. Individually designed areas are localised and are consequently unaffected by adaptations from a central location. UNIQA Österreich customer applications such as forms for customer requests, advisor websites or the direct login to the customer platform "MyUNIQA" have been integrated into the CMS by Gentics, facilitating centralised administration for content managers. In addition to the uniqa.at website, numerous other platforms have also been implemented in the Gentics CMS such as the UNIQA Group website, the customer platform MyUNIQA, a specialised application for sales as well as others. "Gentics won following an intensive process of selection from the TOP CMS providers in Europe. With Gentics we were able to transfer all of the content from the old system and not only migrate it into Gentics CMS, but also transfer it to new technologies".